Xikar 1.75 inch Round Digital Hygrometer allows you to replace that old analog gage with a new state of the art Digital Hygrometer that fits in the same hole in your humidor. Xikar Digital Hygrometers are accurate to +/- 2% at 70% humidity. Xikar Digital Round Hygrometer Registers temperature in both Fahrenheit and Celsius. 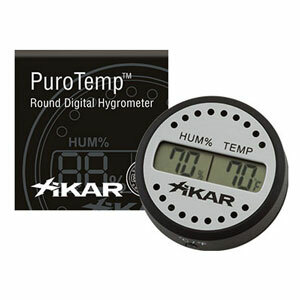 Xikar 1.75 inch round Digital Hygrometer.